Click here for Day 6 Part 2 - Lunch @ Relais du Pont Neuf. After breakfast, my family and I headed to the Cathédrale Notre Dame de Paris. This is one of the most famous churches in the world and it is on the Île de la Cité. The Île de la Cité was the centre of ancient Lutetium, medieval Paris and the contemporary capital. Appointed bishop of Paris in 1160, Maurice de Sully decided to give the capital a cathedral worthy of France’s largest city. 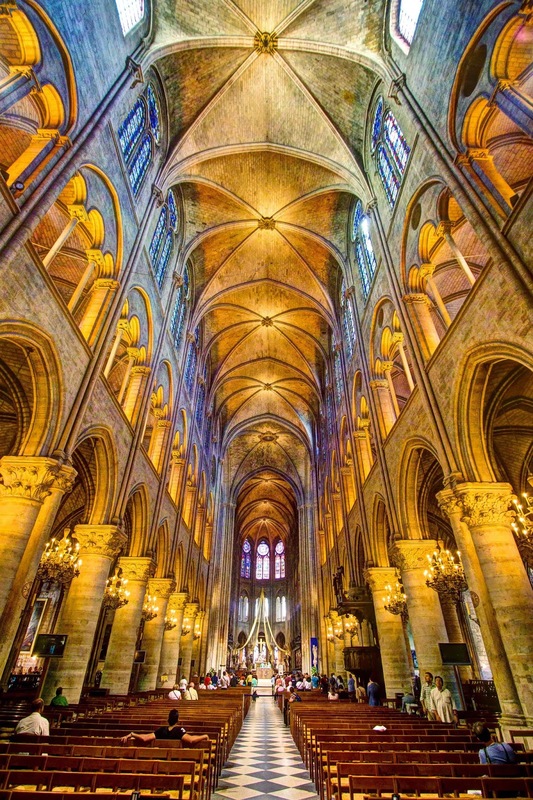 Construction began in 1163, and Notre-Dame would be completed some 100 years later, in 1272. The cathedral has survived everything from the French revolution to multiple restoration. 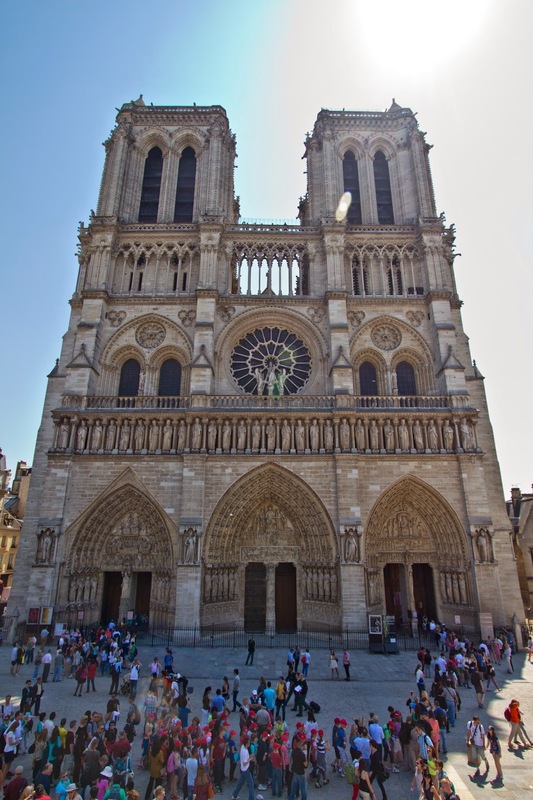 Currently, the Notre-Dame de Paris is very old, over 800 years old! 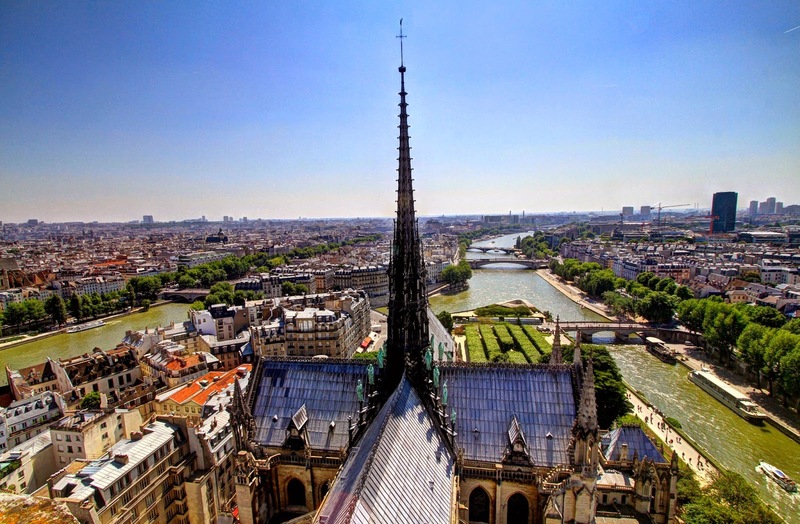 Mary, Mother of God, to whom Maurice wanted to dedicated the entire cathedral Notre-Dame de Paris, is the reason why the cathedral is also known as Our Lady of Paris! An example of a significant event that has taken place in the church is the coronation of Napoleon I on 2 December 1804 at Notre-Dame which you can see on a 1807 painting by Jacques-Louis David located in the Louvre Museum! The cathedral is open daily, 365 days a year between the hours of 07:45am and 6:45pm weekdays; closing time on Sundays are extended to 7:30pm. The entrance to the cathedral is free as it is a working church. 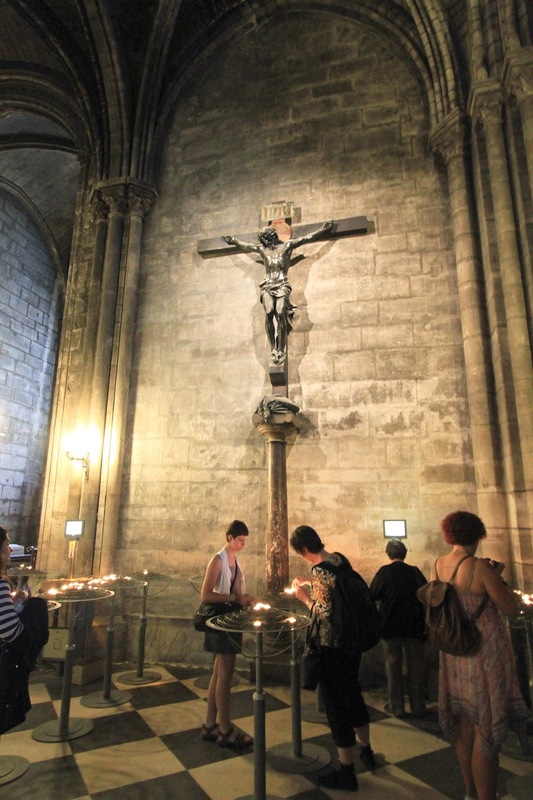 However, visiting the cathedral's towers and its crypt is chargeable at €8.50 per adult but included in the Paris Museum Pass. As you climb to the top, check out the cathedral's architecture. The roof was made using 1,320 lead plates weighing over 210,000 kilograms! What is shown in the picture below is a Chimera. 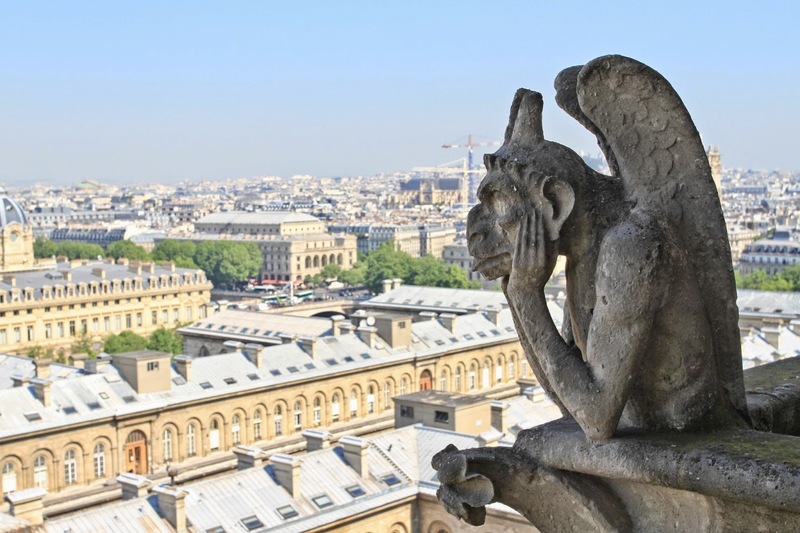 Chimeras are commonly mistaken for the Gargoyles of the Norte Dame. Most of them are on the façade, seated on a gallery, watching the people below and scanning all of Paris. The most famous chimera is le Stryge shown below. So where are the Gargoyles and what are they used for? When you are queuing to enter the Tower of Norte-Dame, look up and see fearsome looking heads perturbing out of the walls of the Norte-Dame. The conspicuous stone gargoyles have carried rain from the roof of the famous Cathedral of Notre Dame for move than six hundred years. Down through the years they allowed rainwater to fall free of the cathedral, thus preventing damage to the masonry. After the introduction of the lead drain pipe in the 16th century the gargoyle’s notoriety faded out but they were still used as decorations. Did I mention how much do you have to climb to get to the top? The cathedral has a narrow climb of 387 steps and there are no lifts! Therefore, the towers are not accessible for people in wheelchairs. 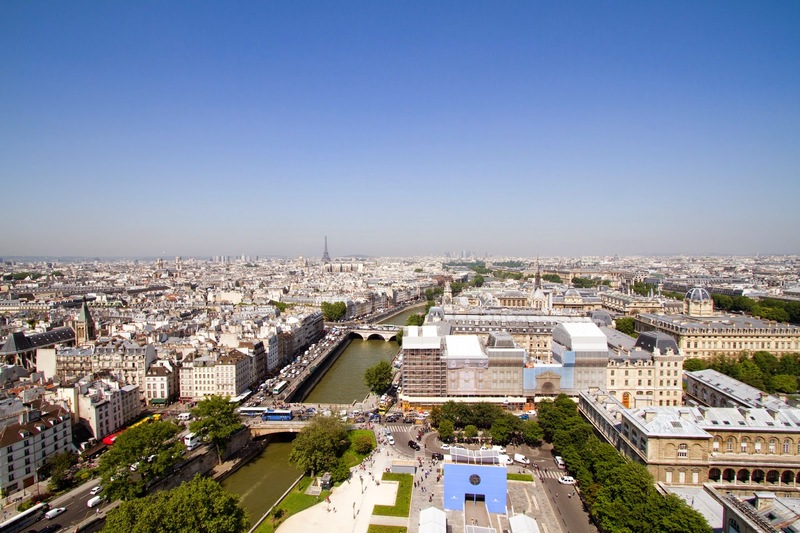 However, do consider heading out to other attractions such as Arc de Triomphe, Galeries Lafayette, and Montmartre who offer great views that are more accessible. Please avoid wearing heels when doing the climb. It was definitely exciting to make the climbs as the stairs gets narrower as you reach the top. The views are absolutely worth the climb. Photos are permitted inside the cathedral as long as you don't use a tripod and FLASH. A Flash might attract angry attention from the guards. The interior is a feast for your eyes. As this is an actual church, people do come here to worship. 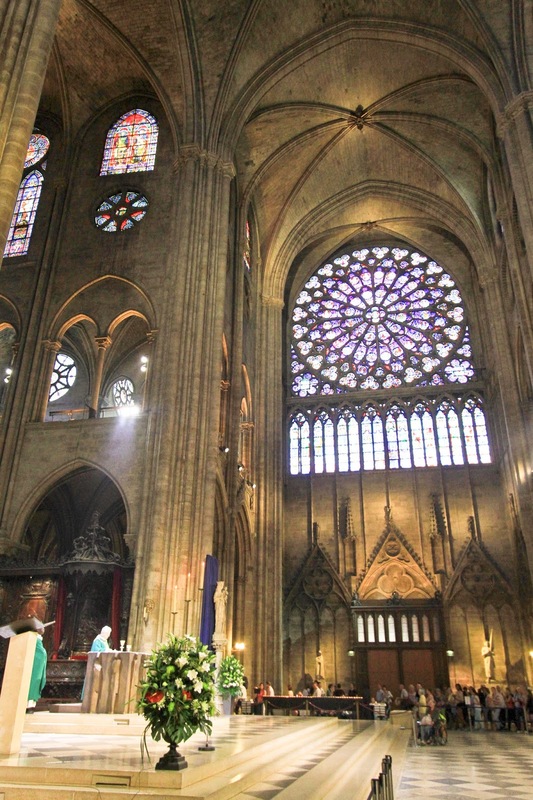 The photo shown below is the South Rose Window which was a gift from the king Saint Louis. It was designed by Jean de Chelles and Pierre de Montreuil. The Cathedral’s first construction master, Jean de Chelles, laid the first stone of the south transept façade in 1258. The South Rose Window, a central element that thrones over the transept façade, was constructed in 1260 as a counterpoint to the North Rose Window, which was built in 1250. Like its north sister, the South Rose Window reached 12.90 metres in diameter and, if you include its bay, a total height of nearly 19 metres. This rosette is dedicated to the New Testament. I decided to do a HDR for the interior to give justice to how beautiful this place is. Even though you aren't a Roman Catholic (neither am I), you will be blown away by the magnificent interior of this Cathedral. The statues, altars, stained glass, art works are amazing. Saint Denis holding his head. 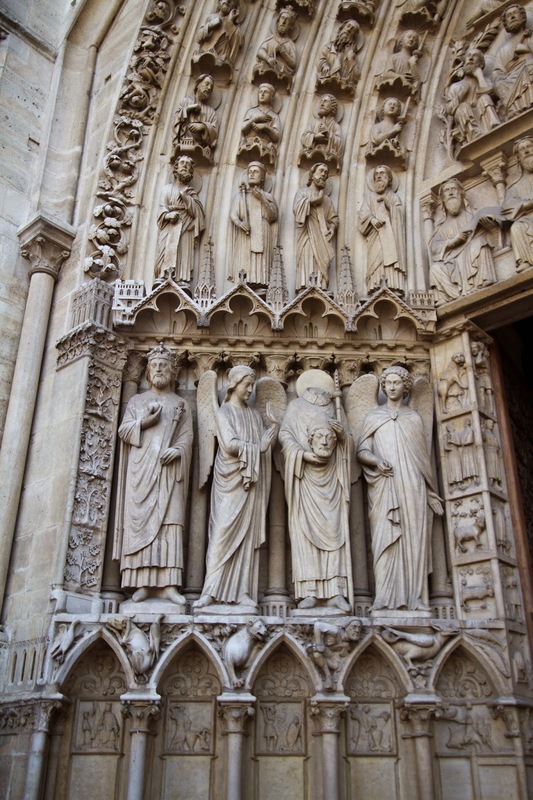 Left portal of Notre Dame. After we visited the Notre Dame, we searched for Point Zero which is just steps away from the Cathedral of Notre Dame. But it wasn't hard since there was a small crowd of people staring at this this small octagonal brass plate set in the ground. 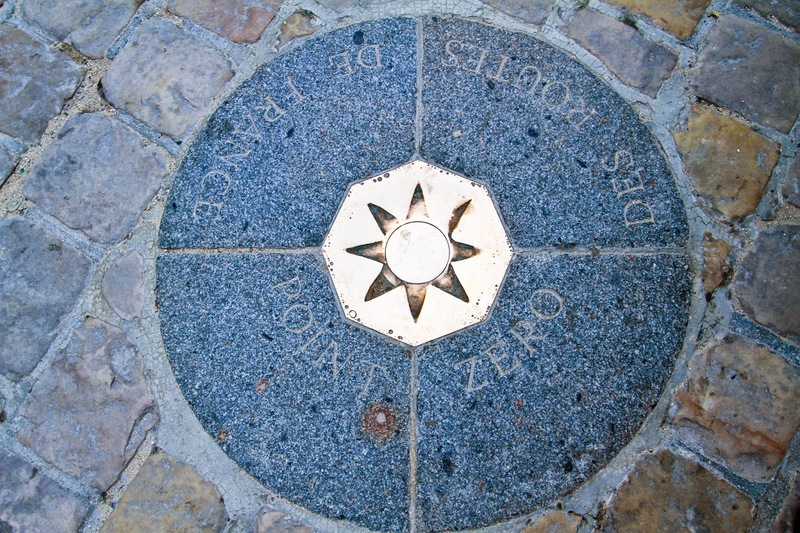 This is Paris Point Zero marker and the distance of any location chosen in the city is measured from here! I hope you get a great picture here! We saw many people doing random things (Spinning on it, etc.) as it supposedly good luck. We woke up late and missed the opportunity to visit Sainte-Chapelle (Holy Chapel) which was located on the same island as the Notre Dame. You should visit it if you like stained glass windows. Sainte-Chapelle is famous for its medieval stained glass windows that appear to float and hold up the structure. There is a fee to enter Sainte-Chapelle at €8.50 per adult but included in the Paris Museum Pass. Lines are shortest within the first hour of opening. Opening hours are from 09:30am - 6:00pm. Take note that the chapel closes from 1:00pm to 2:15pm. Do not bring sharp objects as they have security checks. - The Notre-Dame de Paris is very old, over 800 years. Arrive early to avoid the queues for the Notre-Dame Towers. 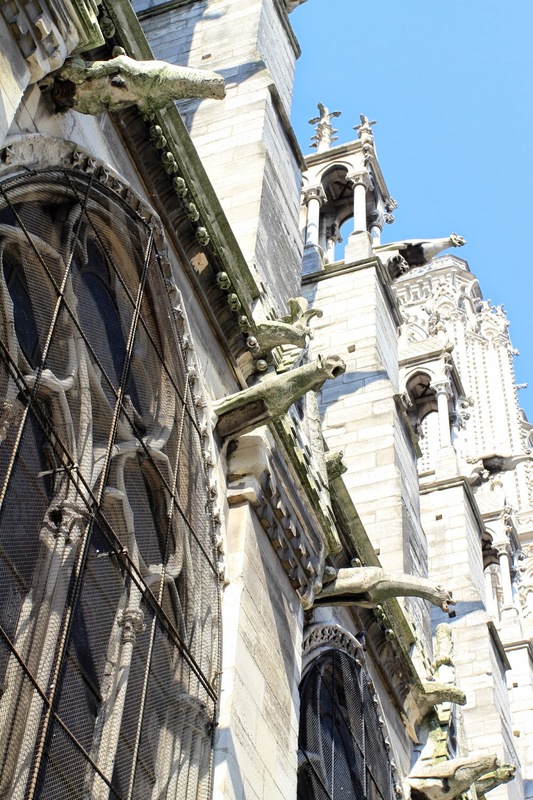 - To access to Notre-Dame's towers, it will be €8.50 per adult or you could use the Paris Museum Pass. The latter does not give you any priority queue at this attraction. - The 387 narrow steps to get to the top of the Notre-Dame. We met a couple who were in their 60s and managed to reach the top. If you are worried about climbing to the top, be the last to enter the stairs where you will be able to climb at your own pace where no one will be behind you. 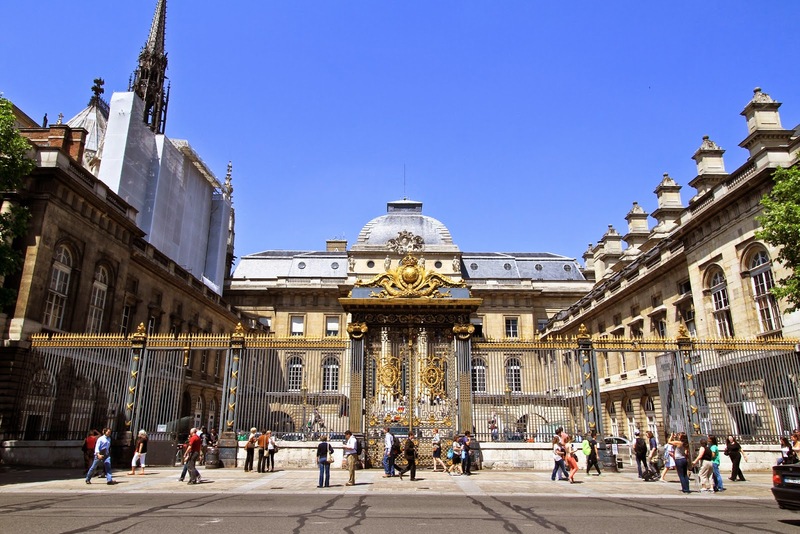 - Entrance to Sainte-Chapelle is €8.50 per adult or you could use the Paris Museum Pass. The latter does not give you any priority queue at this attraction.